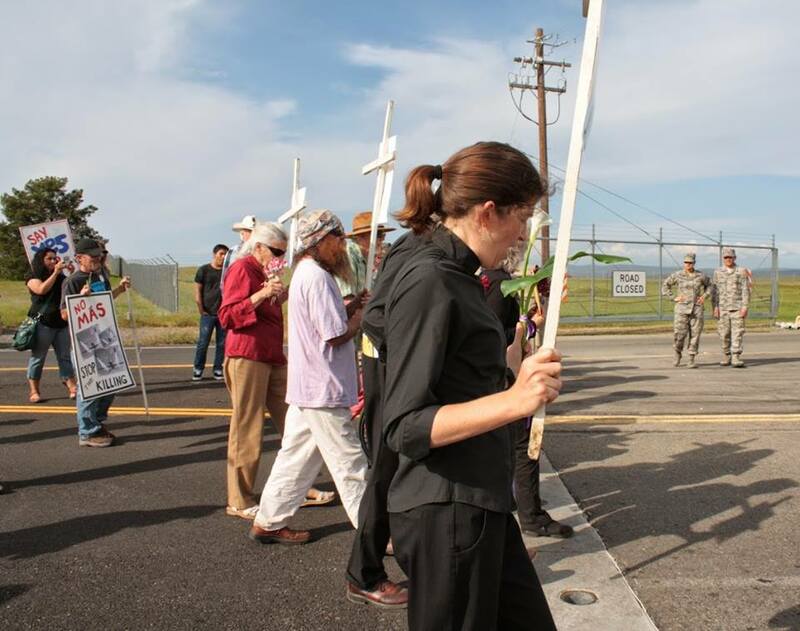 On April 18, internationally recognized peace activist Kathy Kelly was detained with ten other anti-drone demonstrators at Beale Air Force Base in California following a Good Friday prayer service. Organizers said that they gathered at Beale, “in the shadow of killer drones, modern day equivalents of the cross, to pray, to act, and to build a community of peace.” There have been frequent anti-drone demonstrations at Beale, home of the Global Hawk Drone, a surveillance drone that assists in finding targets for armed Predator and Reaper drones. The Reverend Dr. Gerald O. (Jerry) Pedersen, former U.S. Marine, present as part of the Honor Guard on the U.S.S. Missouri during the surrender of the Japanese at the end of World War II, retired Lutheran pastor, Sacramento, author of Unfinished Journey: From War to Peace, From Violence to Wholeness, member Veterans for Peace. The Reverend Elizabeth Griswold, pastor of Parkside Community Church, UCC, in Sacramento. The Reverend John Auer, retired United Methodist Pastor, Wesley UMC, Fresno. The Reverend Sharon Delgado, retired United Methodist Pastor, of Earth Justice Ministries, author of Shaking the Gates of Hell: Faith-Led Resistance to Corporate Globalization, in Nevada City. Others who were arrested on Good Friday were Michael Kerr from Bay Point/Pittsburg, Rodger Stall from San Rafael, Arthur (Buff) Whitman-Bradley, Nancy Reiner from the Bay Area, Bob Russell from Pleasant Hill, and Pamela Osgood from Grass Valley. The Reverends Pedersen, Griswold, and Delgado, and Michael Kerr were also detained on March 5, Ash Wednesday, for crossing the demarcation line. Over fifty people attended the service, which included prayers, songs, Holy Communion, and reflections by Kathy Kelly. Following the service, some demonstrators crossed the demarcation line onto Beale property in an attempt to deliver a letter to the base commander, along with two statements about drones from religious groups: The World Council of Churches’ Statement on the Use of Drones and the Right to Life and “A Call from the Faith Based Community to Stop Drone Killings,” signed by religious leaders from around the country. Kathy Kelly is coordinator of Voices for Creative Nonviolence, a campaign to end U.S. military and economic warfare. In 2011, Kathy Kelly was a passenger on “The Audacity of Hope,” the U.S. boat in the international flotilla to break the illegal occupation of Gaza. She has taken nine trips to Afghanistan, where she has lived alongside ordinary Afghan people in Kabul. She has joined activists in the United States to protest drone warfare outside of military bases in Nevada, upstate New York, and Whiteman Air Force Base in Missouri.